tl;dr: Financial technology (fintech) startups have enjoyed a good run recently, but may face stiff competition from big banks if Trump repeals Obama-era financial regulation. While half of American voters are still reeling from the historic and largely unexpected victory of Donald Trump, there’s been a rally on Wall Street, for Wall Street. Public financial companies have performed very well over the past week and a half since news of Trump’s victory hit the market. Between market close on Election Day and the end of Thursday’s trading session, the largest finance-focused exchange traded fund on the Street, closed up nearly 11%. Among the firms pushing higher is Goldman Sachs, up nearly 20 percent. Despite a recent CEO shakeup, shares in Wells Fargo managed to rise by 16 percent over the same time period. What came as a shock to some seems like a real confidence boost for finance-focused investors. Will this newfound bullishness in the investment banking and financial services sector trickle down to fintech startups? In other words, how well will the gains experienced by sprawling mega-banks and investment houses translate to their younger, more specialized, tech-savvy competition? The answer, as it turns out, is not as well as you might expect. 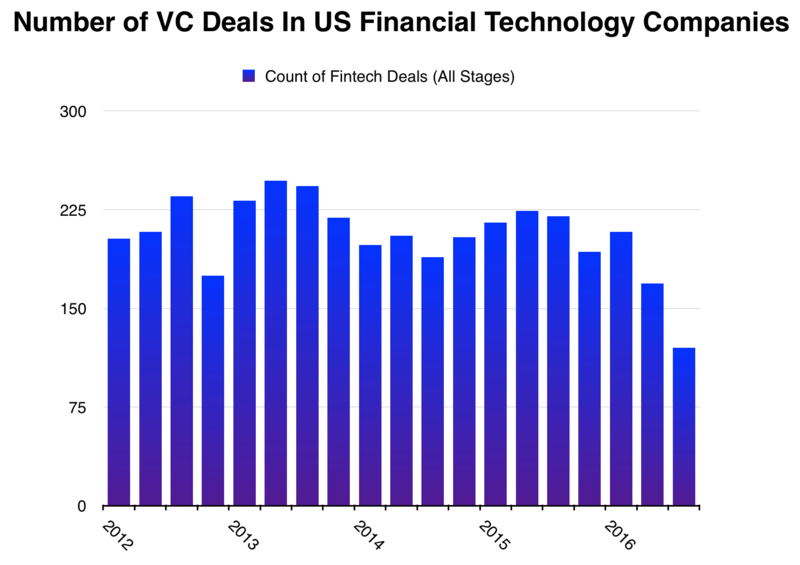 Over the past five quarters, VC deal volume with fintech startups declined precipitously. Between Q2 2015 and the end of Q3 2016, the number of investments made into American fintech startups of all stages exactly halved. 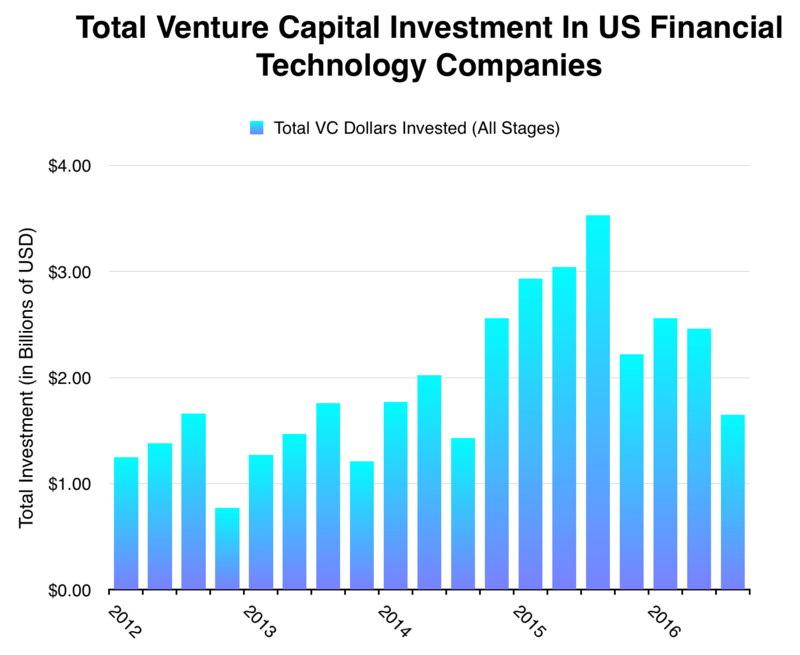 The chart below depicts the number of venture capital investments made into US-based fintech companies at all stages since January 2012 (which was the start of Barack Obama’s second term as POTUS). The amount of money venture investors are deploying into fintech companies has also halved. Between its peak in Q3 2015 and the end of September 2016, the amount of money invested into fintech companies declined 53%. As we found back in August, close to 75% of capital invested in unicorn companies is still locked up in private equity, meaning that both venture capital investors and employees with stock haven’t yet gotten the chance to cash out.. Earlier this week, Mattermark also covered the stagnating tech IPO market, which seems to be taking its end-of-year vacation a bit early. But even an IPO today might not bode well for many fintech companies. While investment banking and financial services giants like Goldman Sachs, Bank of America, and JPMorgan Chase have been on a real tear since the election, younger public fintech companies like Square and Paypal have not fared so well. From market close on election day, to the end of trading hours on Thursday, November 17, 2016, Square is flat and Paypal is down 4%. Were it not for rallies in each company’s shares on Thursday, their post-election day performance would be much worse. This might strike some as odd. Why might newer fintech companies face such an uphill battle under a Trump regime? Will Big Banks Play The Fintech Game? Last week, The Wall Street Journal’s Telis Demos explained that Trump’s election may bring change to the regulatory system governing larger financial institutions. It seems like many fintech companies are currently benefitting from a kind of “regulatory arbitrage,” just big enough to make money, but small enough that some of the most stringent rules do not apply to them. In other words, the repeal of Dodd-Frank would be a return to some of the wild west days before the ‘08 Financial Crisis, when big banks and financial services were allegedly freer to innovate, for good or ill. Smaller upstarts weren’t affected because they were under Dodd-Frank’s $10 billion asset threshold, which forces companies to comply with the stipulated regulations, according to a brief report from Grant Thornton. With the possibility of the arbitrage window closing, investors in fintech and tech-forward banks – both public and private – might continue to hold their collective breath to see what happens next. Previously, major banks have had to rely on M&A and complex partnerships as their main innovation strategy. For example, in 2012, clearXchange, a payments platform collectively-owned by Bank of America, JPMorgan Chase, and Wells Fargo, made a deal with Fiserv, to make its subsidiary, CashEdge Inc. (makers of Popmoney), the standard P2P payments platform for the US consumer banking sector. Now, there are companies like Venmo and Square’s Cash service to help users send money to one another’s mobile devices, but they have a long way to go to match their big-bank competition. The New York Times’ Dealbook blog stated that Chase QuickPay processed approximately $20 billion in 2015, whereas Venmo processed less than $10 billion that same year, a number backed up by reporting from Recode. 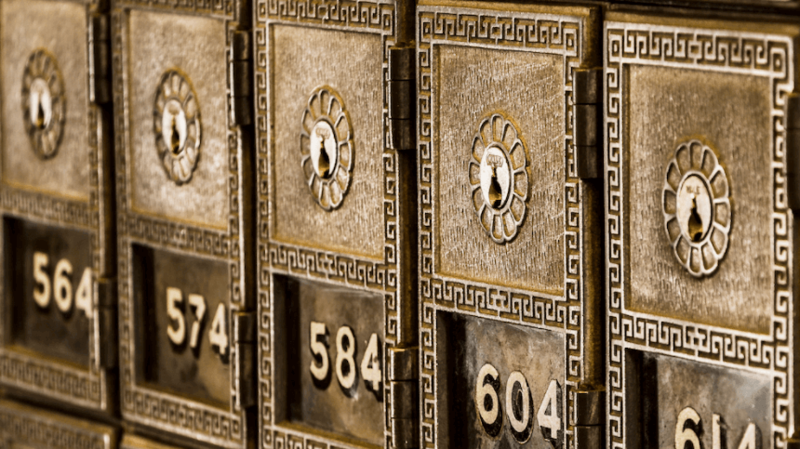 There aren’t many publicly available statistics about Popmoney, but that service is the backbone of many smaller banks’ p2p payments platforms. Again, smaller upstarts face an uphill battle against entrenched competitors that are backed by the very institutions they hope to disrupt. But there are hints that incumbents are thinking of themselves less as stodgy financial institutions and more like financial technology companies. After all, the formerly bank-facing clearXchange platform is being re-branded and offered as a consumer-facing app called Zelle, according to coverage from the Wall Street Journal in August. Zelle, whose big-bank parent companies are touting as their Venmo-killer, is due for release in 2017. Of course, the success of Zelle is to be determined, as is the fate of many independently-owned fintech companies. If big banks take a lesson from startup culture and “pivot” themselves into financial technology companies after the shackles of existing regulation is thrown off, tiny little upstarts may be up against some very well-capitalized competitors. The way this plays out is less likely to be a story of “David beats Goliath” and more of “If you can’t beat ‘em, join em,” especially if venture investors continue to hold back and soft landings are in order. We took a look at over 2,200 VC deals struck with companies Mattermark tags as being in the “Bitcoin,” “finance,” or “banking” industries. We then aggregated the data by quarter and made the charts.